Convert movies for viewing on Nintendo Wii. Is there a better alternative to Wii Transfer? Is Wii Transfer really the best app in Video category? Will Wii Transfer work good on macOS 10.13.4? Wii Transfer... movies, music, and pictures on your Nintendo Wii. Wii Transfer can share your movies, music, and pictures directly to your Nintendo Wii using the Internet Channel. 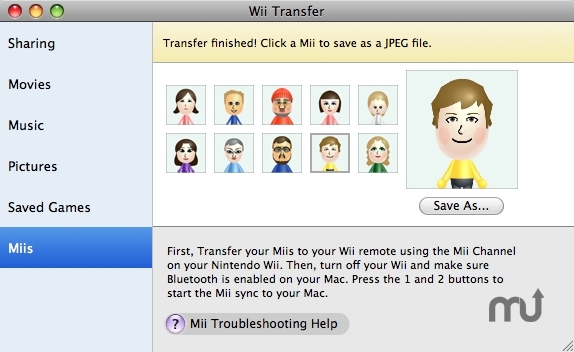 Copy Miis from your Wii back to your Mac and save them as images. Browse iTunes playlists and iPhoto albums on your television. Convert your movies to a format the Wii understands, streaming directly from your Mac. Wii Transfer can even manage saved game backups copied to an SD card. Version 2.7.2: Release notes were unavailable when this listing was updated. Wii Transfer needs a rating. Be the first to rate this app and get the discussion started!